The future of Britain is at stake. In the turbulent times of the Dark Ages, the despotic Uther Pendragon, High King of Celtic Britain, is nearing death, and his kingdom is being torn apart by the squabbling of minor kings. But only one man can bring the Celts together as a nation and restore peace - King Arthur. Artorex (Arthur) doesn't yet seem like the great man he will grow into. We meet him as a shy, subservient twelve-year-old living in the foster home of Lord Ector, who took in Artorex as a babe to protect him from murderous kin. A Dry, Dull Tale, Marred in "Realism"
Hunted like an animal by Norman invaders, Bran ap Brychan, heir to the throne of Elfael, has abandoned his father's kingdom and fled to the greenwood. There, in the primeval forest of the Welsh borders, danger surrounds him, for this woodland is a living, breathing entity with mysterious powers and secrets, and Bran must find a way to make it his own if he is to survive. Like the forest itself, Hood is deep, dark, and at times savagely brutal, yet full of enchantment and hope. 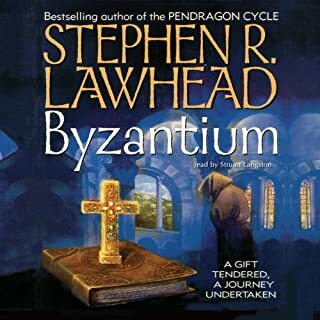 Internationally acclaimed author Stephen R. Lawhead has created a lyrical rendering of a time-honored story that will lead you down strange pathways into another place and time. "Hood" has only a passing similarity with the story we might think of as "Robin Hood". The very basic premise, some of the characters, era and political landscape were much the same, though different enough I did not feel I could predict where the story might lead. I had trouble "putting the book down". It flows very well; the narrator does an excellent job maintaining the characters and mood of each scene. I often found myself closing my eyes, transported to a different time and place, able to visualize the story as it was read. Very nicely done! On the negative side, it felt as though the novel’s theme was closer to some of Lawhead's other books than it was to Robin Hood. The only choppy scene transitions in "Hood" were where the author chose to include references to “Albion”, or to try and weave in the story of the princely warrior who could save the world - beautiful maiden/old hag and all. These allusions weren't needed - "Hood" stands very well on its own. I caught myself wondering, albeit rarely, if Lawhead was “plagiarizing” some of his previous works in order to fill out the book, which detracted from its overall quality. It occasionally felt/read as if "Hood" was written simply as a sequel to one of Lawhead's other series. All in all, still an excellent book that I highly recommend. I can’t wait to see what the next one holds! Good story ruined by an inept narration. This book is a fun and lively reinterpretation of the Robin Hood legend. It takes the familiar characters and scenarios into a richly crafted narrative in the style of a contemporary Historical Fiction novel. Although this reinvention of much beloved characters has become quite common, Lawhead has done a first rate job. 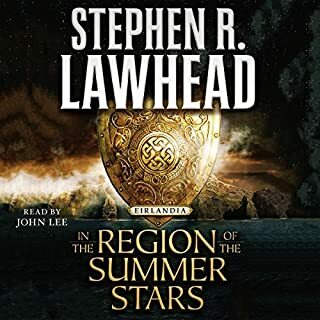 It is, however, a terrible disappointment to find this story in the hands of the most inept narrator I have encountered in all the years I have been a subscriber to Audible. I urge anyone who wants to read this entertaining novel to pay special attention to the sample audio. If you find the narrator to be acceptable, by all means buy the book, but it would probably be best to simply buy the paperback and spend your listening time with a better read audio book. The story is ok, similar in minor details to the well-known version of Robin Hood, but I had an extremely difficult time concentrating on the story due to the reader's awful attempt at a British accent. I was also frequently distracted by his mispronounciation of not only some of the Celtic words but even commonly used words like "sinew". I found myself rolling my eyes in the middle of the story, missing parts of it due to being pulled out of the story by mistakes by the terrible reader. Thus, the story may be on ok read but the reader ruined it for me and I wouldn't recommend this version to others. The Robin Hood you thought you knew meshes tightly with this new version in a well researched tale of ancient Wales. What? You thought Robin was English? Try again! This book was a delight to listen to and the prologue was fascinating. 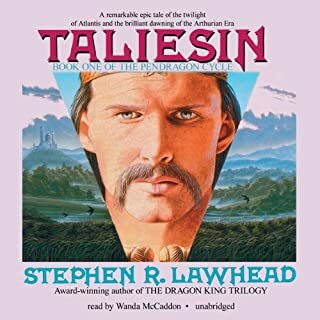 The narrator did a great job fleshing out the characters with a variety of voices but did not resort to cartoonish sound effects, letting the text create the scenery for the listener instead. A good story read by an awful narrator. I am confused, is he reading the names of towns in an attempt to reproduce a medieval sound or is it that he doesn't now the correct pronunciation. I have been an avid user of Audible and as I am English I felt the author was let down badly in this effort. Hood provides a whole new look into the Robin Hood legend. It is a richly written tapestry late 11th Century Britain. The enemy are the Normans (and the Frank). It's told primarily from the protagonist's (aka Bran Bendigedig, the Hood) perspective and uses the etiquette, pacing and milieu of the day for dialog, action and relationships of the day. I thoroughly enjoyed this but my teenage boys found it a bit slow. Stephen Lawhead provides a compelling argument in the supplement to the book "Robin Hood in Wales" to move the Robin Hood we know and love from Sherwood Forest (and indeed from being English) to being a Welshman in Wales. The reason I bring this up is this sets the tone for the book and is indicative of Mr. Lawhead's writing. He is thorough in his research and, as I indicated above, the subsequent setting of his book and the way the dialog and action move forward. He writes as if this could have been a personal history. I went between the Kindle and Audible versions. Adam Verner does an outstanding job with the challenging Welch titles and overall language. His pacing is spot on with Bran being quicker spoken than Iwan. Irritation, whininess and arrogance of just the right amounts come from Count Falkes de Braose voice. There are times that the period is spoken quite slow, but I suspect the paces of things were a bit slower. If you like audiobooks, you'll enjoy this one. I was not sure what to expect.I did not care for the narrator, almost made me stop listening in the beginning until the story picked up. 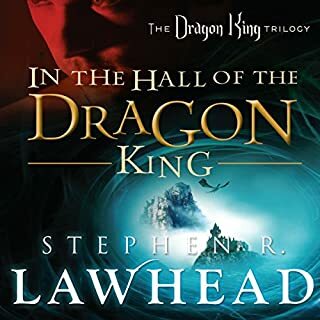 The narrator read characters well and intoned, he just had a very classical high pitched haughty accent that I found annoying and will avoid in the future. The story itself was an interesting shift to the traditional Robin Hood stories I have heard in the past. Traditional characters were woven the story creatively providing some "aha" moments when their names are revealed. While I did enjoy the story I am not sure I will go on to the next one if it is the same narrator. 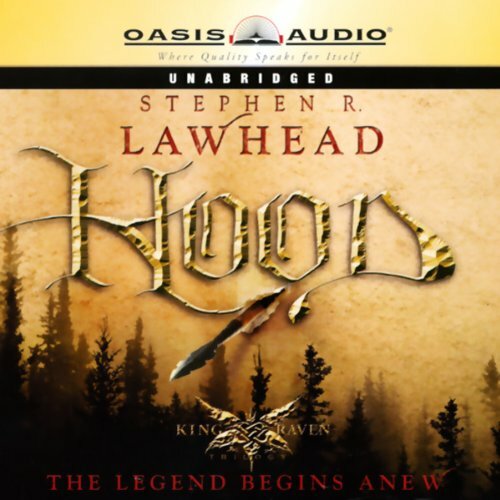 I wasn't sure what to expect from Stephen Lawhead's "Hood". It's my first book of his, and at first, I was put off by his wordy, ornate writing style, his tendency to get fixated on describing certain scenes or states of mind in great depth. As the story has progressed, the rhythm and pace has began to feel like home, amidst the primitive, rural Welsh people the story is set. As a retelling of Robin Hood, I was expecting (and often finding) a Eurocentric world view, complete with crippling gender roles, colonizing mindsets, and the romanticizing of violence. 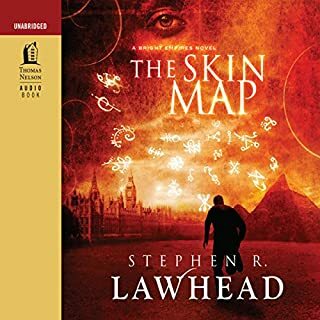 As the story is unfolding, however, I'm finding it's earthy, primal spirituality a surprising catalyst to some of the other themes, and find myself wondering if Lawhead will be able to rise above glorifying violence and power by turning the story in a subversive way. He's already introduced a powerful women who provides deep counterbalance to gender roles in the story. We'll see where this story goes. This book was an excellent read. The beginning started out somewhat slowly, but it really ramped up after the first 30-45 minutes. The author integrated a well loved story with rich history, excellent descriptions, a troubled but essentially lovable "Hood", and a thread of magic that was both believable and a perfect addition to this great story. I am early and impatiently anticipating the next book!! I enjoyed this story. However, it is worth noting that it really bears very little relation to stories of Robin Hood. 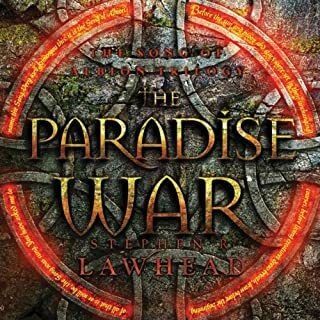 This said, it is an enjoyable fantasy novel and I hope to download a sequel soon. A good story, but not only can the reader not pronounce the Welsh names, he can't manage the Latin and French phrases. This spoiled the atmosphere and flow of the narrative for me every time it occurred. I'm getting the remaining parts of the trilogy in paper book form. great story made difficult to listen to thanks to the terrible pronunciations of names, places and anything Welsh.